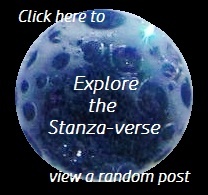 New Lang Syne | What Rhymes with Stanza? Wow! 2016 is here already! I suppose I made some resolutions for last year, but having forgotten what they were, I can neither celebrate my successes nor berate my shortcomings. And I’m content with that. I think contentment was pretty much my theme for last year, and in that regard 2015 was quite fulfilling. Cute canine couched on a crimson coverlet contentedly contemplating current conditions. For 2016, I am foregoing the whole New Year’s resolution exercise, and in its place I’m using an idea that I picked up on The Tao of Dana blog. I’m going to consciously choose a new overlying theme for the coming year. That way it doesn’t become something to flog myself over for not completing. It’s just a gentle nudge in the direction I want to travel. So what should my 2016 theme be? I’ll ponder that question in the next few days. And I’ll write it down and post it somewhere so I won’t forget. But for now, I’m content to just let the new year unfold as it will. This entry was posted in humanity, Photography, spirituality and tagged eskie, New Year's, resolutions, theme. Bookmark the permalink.